Zapier is an integration tool. It allows your different software applications and services to ‘talk to each other’ and be linked up. It enables you to automate certain tasks or set up automatic systems. This can either save you time or help you to create a workflow that will help you. I use Zapier in a pretty simple way – to send my blog post ideas from a rough list of notes in Evernote to a project management board in Trello. To show better how I use Zapier, though, I need to explain the background of how I use these two tools – Evernote and Trello. Evernote is designed as a note-taking app, and it really started to become useful for me when I decided to use it to get ideas out of my head and recorded ‘on paper’. Ideas naturally crop up randomly, so I’ll often do a ‘brain dump’ into Evernote. One of the app’s great benefits is that it performs well in its various versions, allowing you to capture the idea wherever you are. It works well on desktop , web and mobile platforms. As far as I know, it behaves nicely across different operating systems too – I use it on Windows 7, 10 and Android. The next benefit of capturing your ideas, in productivity terms, is that you don’t forget things. This also frees up mental space – it can reduce your stress greatly to have fewer ‘pending’ ideas rattling around your brain. Additionally, it helps me to develop the idea into something actionable and achievable. Once I’ve captured it, I can refine it, create bullet points, use checklists or strikethrough to mark things as done. I can also link to folders in Google Drive that may contain images or text drafts. Lastly, Evernote allows you to organise your notes into Notebooks. I tend to categorise and organise things. My Evernote system includes Notebooks for my Construction Content website and my cycling blog, as well as for my personal development and home life. The Notebooks are an important point here. I use Zapier to look for new Evernote notes in specific notebooks and create a card on a specific Trello board. I’ll explain that in more detail later. This takes me to Trello. Trello is a productivity tool that uses a drag-and-drop system of ‘to do’ cards on project boards. 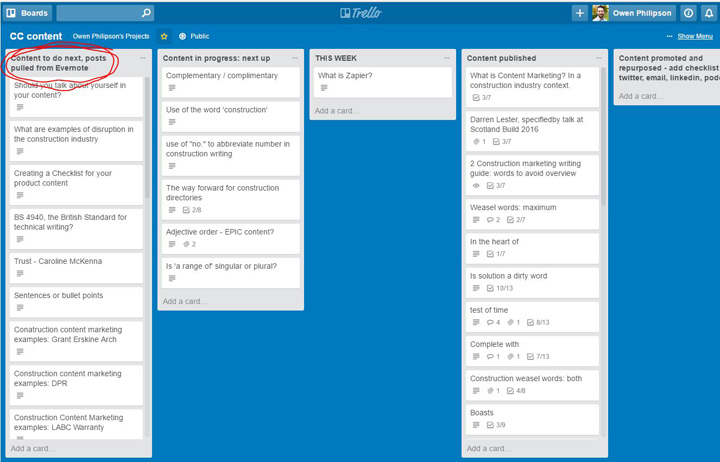 I will add one card for each blog post to a specific Trello board to keep my content plan moving. Within each card, you can add checklists, which are useful for breaking down the blog post into its constituent sub-tasks. These include: getting raw material, getting pictures, editing text, checking for feedback, SEO checks, publishing, etc. I have found that a simple three-column board helps me to keep tasks progressing forward. For some of my Trello boards, I add another column – a ‘longlist’ of ideas, which sits on the left. I use this as a longlist of ideas to pick from. When you create an account in Zapier, it allows you to log in to your various apps such as Evernote, Trello, Gmail, Facebook, Slack, Office 365, and many others. You can automate some of the functions of these apps using Zapier – the possibilities are endless. In order to use Zapier productively, you have to adopt a ‘systems thinking’ mindset. One way to do this is to keep an eye out for any simple tasks that you do repeatedly. If you find yourself thinking ‘a monkey (or an unpaid intern) could do this’, then maybe Zapier could automate it for you. These automations are called ‘Zaps’. You need to be able to think logically. Imagine a workflow that is triggered by certain specific circumstances. Let’s say, for example, you receive emails from a specific address that always result in a task for one of your employees. You could tell Zapier to add the content of the email to a Trello card, a Google spreadsheet, a folder in Google Drive or a ticket in JIRA. You could probably set up another ‘Zap’ to notify an employee to take a certain action. Zapier effectively allows anyone to be a programmer, using modular elements that you can slot together. 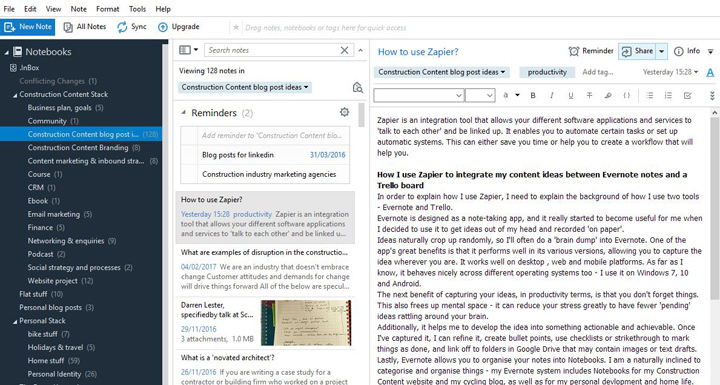 Any new Evernote note, created in my Notebook called ‘Construction Content blog post ideas’, is added to a Trello board called ‘CC Content’, in the first column, which acts as my to-do longlist. It has taken quite a while to explain that simple Zap, because it is part of a wider productivity workflow. I feel that it is important to have a strategy, system or workflow in place before starting to use a productivity tool. If the tool serves your purpose, it will work well for you. I get blog post ideas out of my head into Evernote, to free up mental space. Posts in the longlist can be moved on to the ‘to do this week’ list when I’m ready to write them. From there I use Trello checklists to help get them done. I move them to the ‘done’ column when I am finished. From there, they should* go on to a list for promotion and repurposing. This one very simple Zap workflow is an example of how you need a wider ‘systems mindset achieve real productivity. The tools don’t guaratee productivity – the most important things are how you design the process and how you act. Thanks for taking the time to comment Nashon, I appreciate it.